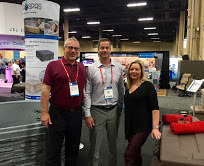 Hot tub distributor Spa Crest Europe hit the jackpot at the International Pool Spa Patio Expo in Las Vegas by securing an extension to an exclusive agreement to supply roto-moulded Tuff Spas to British dealers. A fledgling network of Tuff Spas retailers, including Shropshire Pools & Spas, under the stewardship of the Wigan-based distributor has helped to achieve UK success way beyond the expectations of the manufacturer who has achieved an inaugural WhatSpa? Best Buy Award in the 2015 issue of the consumer magazine for its Tuff Spas TT650 model. Coming in at 196 x 196 x 75cm, the five-seater TT650 is the largest spa in the Arizona-based manufacturer’s stable and includes a lounge seat that has been praised in the 2015 WhatSpa? Verdict. It also highlights the deep multi-level seating and optional ‘Tuff Top’ upgrade that makes it the only roto-moulded spa on the market to provide this hard cover choice for customers. It has certainly proved a popular choice with Tony and Tracy Roberts at Shropshire Pools & Spas. 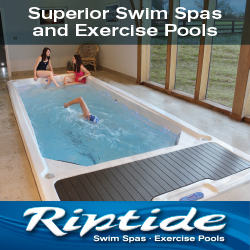 The Spa Crest and Tuff Spas dealership, which also specialises in commercial and residential swimming pools, has reported that the Best Buy Award-winning model has topped their sales chart after they launched the Tuff Spas range this year at their wet leisure headquarters based at the Percy Throwers Garden Centre in Oteley Road, Shrewsbury. “The WhatSpa? Best Buy Award-winning TT650 has been our best-selling model of 2015,” divulged Tracy. The deal to introduce the rugged USA brand to the UK market was originally signed between Tuff Spas and Spa Crest Europe in Orlando at the 2014 International Pool Spa Patio Expo. Spa Crest Europe Managing Director Tony Welsby then launched the range to prospective dealers on his exhibitor stand during SPATEX 2015. Tony revealed that the reception by British dealers and consumers and growth in the market has been exceptional, and this paved the way for a new deal to extend the exclusive distribution arrangement that was secured on the Tuff Spas stand at the recent International Pool Spa Patio Expo hosted in Las Vegas. “This has been a year of change for us, introducing a totally new product line to the UK market and extending our stable of quality USA hot tub brands,” divulged Tony. As part of the 20th anniversary edition of SPATEX 2016, Tony and the Spa Crest Europe team, including Carole Darbyshire, will be providing trade visitors to their stand with the chance to see new Tuff Spas models and a second opportunity to find out additional information about becoming a dealership for the brand during the three days of the exhibition at the Ricoh Arena, from January 31 to February 2. “We’re looking forward to exhibiting the line again, but with new models, alongside our Spa Crest products at SPATEX 2016,” said Tony. Tuff Spas President David Midkiff, who is pictured between Tony and Carole at the International Pool Spa Patio Expo, revealed that the manufacturer was pleased with the brand’s launch in the UK market and the first year of sales produced by the blossoming dealer network under the guidance of Spa Crest Europe. Spa Crest Europe will be providing details about the Tuff Spas products on Stand D51 at SPATEX 2016, along with its comprehensive stable of Spa Crest hot tub models including the revamped Coastal range that has the four-seater 2015 WhatSpa? Best Buy Award-winning Hatteras in its many options for dealers. Registration for the 20th anniversary exhibition is free and open now at www.spatex.co.uk or if you wish to reserve exhibition stand space for the three-day wet leisure and wellness extravaganza then contact the SPATEX team via email: helen@spatex.co.uk or michele@spatex.co.uk or directly by telephone on +44 (0) 1264 358558.